Ervin Myers married Ethelda Stoddard August 1901. He was 27. She was 20. Together they would have thirteen daughters (Marion, Rita, Audrey, Ida, Margaret, Jean, Vera, Inez, Roxie, Francis, Violet, Dorythea, and Winnie). They were not rich. They were not poor. They were not famous in their day. But more than hundred years later, this average family has become symbolic of many Nova Scotian fishing families. Ervin Myers, like many men on the Eastern Shore, worked at different tasks throughout the year to provide for his family – fishing, farming, lumbering. He would often be away all week, returning home on Saturday to spend the weekend with his family. With Ervin away, the family’s day-to-day health and comfort rested upon Ethelda and her ability to be frugal, practical, and self-sufficient. 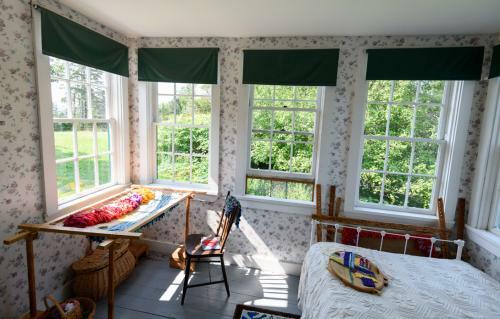 She took care to keep their home beautiful, displaying bouquets of flowers, making colourful quilts and rugs, and filling the house with music and hymns on Sunday evenings when the family would gather in the parlour to sing. 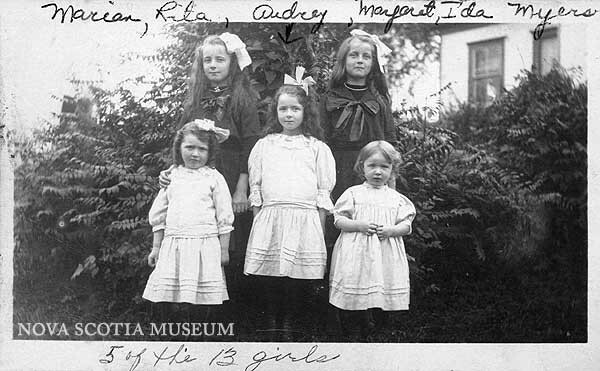 Their first daughter was born in 1902 and the thirteenth in 1925. 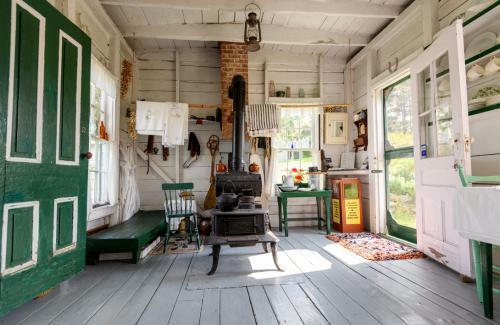 It is not hard to imagine what a lively, busy, and full place this home must have been. The girls attended the local school, helped with chores, and had fun playing baseball in the summer and skating when Navy Pool froze in the winter. As adults, they had their own careers in nursing, secretarial work, and in the armed forces. Most of the daughters would marry and have children of their own, who now come back to visit Fisherman’s Life Museum. A more complete family genealogy can be found in the Nova Scotia Museum Curatorial Report No. 64 “The Myers Family of Jeddore” by Deborah Trask. Today the house has the same feel as it would have when Ervin and Ethelda were raising their family, sometimes even still smelling like gingerbread cookies, however it has undergone several changes and contains only a few artifacts original to the Myers family. The house was built circa 1857. Shortly after inheriting the house from his parents James H. and Hannah in 1915, Ervin raised the roof to add three upper floor bedrooms. The main floor consists of a summer kitchen, winter kitchen, parlour, and bedroom. In 1933 a sunroom was added, which served as a “sick room” for one of the daughters, Ida, after she contracted tuberculosis while nursing. Known as “consumption”, tuberculosis was a deadly disease that many Nova Scotians contracted before antibiotic medicines were discovered. At the time, the only available cure was fresh air, light and lots of rest. Ida would recover have spending over a year quarantined in the room, windows open in all seasons. Today, many visitors to Fisherman’s Life Museum comment on how the house reminds them of visiting relatives. This is a testament to how the experience of the Myers family is reflective of the experience of many Nova Scotian families. How big is your house today? The original house at Fisherman’s Life Museum was only 22’ x 24’, or 528 square feet. Although Ervin Myers’s expansions would nearly double the house in size, it is still significantly smaller than today’s average Canadian House which is on average 1,800 square feet.